Everyone that knows Phil, knows that his drink of choice is Coors Light. 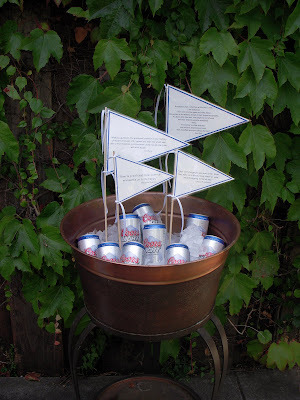 For his 40th Birthday, he wanted a casual party in his back yard with friends and a keg of his favorite beer. His wife, Maureen, planned a fabulous evening keeping in mind...BEER. She found some great quotes from famous people that I made into flags and she displayed all around the party. More flags in centerpieces...the Budweiser one is my favorite! 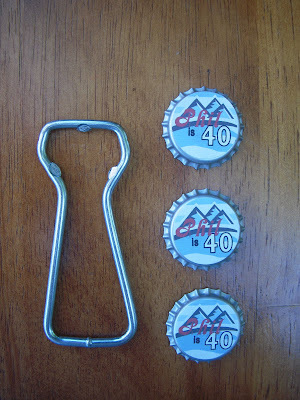 I made bottle cap magnets with a "Coors Light-ish" logo. We put them in cellophane bags with a bottle opener. 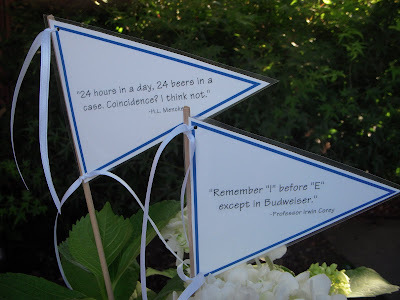 Phil's party flags using beer sayings is outstanding. I think you should send it to the beer company.